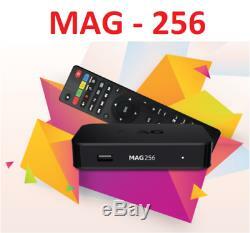 MAG256 Premium Set-top box with HEVC. The new MAg256 is a premium box for high resolution audio and video. HEVC means High Efficiency Video compression. The new MAG256 is a very fast Set-top box due to the use of the new STiH301 chipset. This new unit is using high efficiency video compression technology to provide high quality video faster than other units. Since MAG256/257 Set-top box has been developed to compress the video more efficiently, it became possible to playback video of top quality up to Full HD. This way, Mag256 is able to manage more powerful applications. MAG256 is a unique open platform. You can make changes to the Set-top box software as well as integrate with other developers software. Faster and more powerful media processor ARM Cortex A9 1.5 GHz; HEVC support; USB 2.0 and USB 3.0 ports to connect external carriers and Wi-Fi adapters. MAG256/MAG257 plays the latest audio and video formats; and it supports format and image settings, choice of audio track, and playlists processing. In this App you can connect to content storage in your computer and play it in your TV. MAG256 IPTV Set-top box can play a great variety of video formats. Basically, no matter what format your video is, Mag256 can play it. The image will play in up to 1080p resolution. Both picture and sound will be sharp. Mag256 has an standard Youtube client App. You can play all your favorite Youtube videos. This is great feature because it allows you to play any content from the Internet on the TV. You can do shopping, Facebook, connect to your favorite stream, and watch it on your TV. In this part you can set up your usual settings like time zone, Internet connection. Mini jack cable to RCA (A/V). Wifi antenna (150 mps, 2.4ghz, Usb 2.0 Hi-speed, IEEE 802.11b/g/n). Width= 132 mm depth = 87 mm height = 26 mm. Processor ARM Cortex A9 1.5 GHz. Operating system: Linux 3.3. DRM option = Secure Media. HDMI 1.4a-output, Composite + stereo A/V output, Audio output S/PDIF, Ethernet 100 Mb/s, USB 2.0 and USB 3.0 (WiFi-adapter can be connected), Built-in WiFi 2.4 GHz/5 GHz ac (optional), MicroSD slot (optional). PC and NAS in local networ, Stream media protocols (RTSP, RTP, UDP, HTTP), USB-devices. Audio odecs: MPEG-1 layer I/II, MPEG-2 layer II, MPEG-2 layer III (mp3), MPEG-2 AAC (optional), MPEG-4 AAC LC 2-ch/5.1ch (optional), MPEG-4, AAC+SBR 2-h/5.1ch (optional), Dolby Digital plus (optional), DTS (optional). Audio formats: MP3, MPA, M4A, WMA (optional), OGG, WAV, AAC. Video modes: 1080i, 1080p, 720p, 576p, 480, PAL, NTSC. 265 (HEVC), MPEG4 part 2 (ASP), WMV-9 (optional), VC1 video, XviD; 3D and HD video supporting (up to 40 Mbit/s and above). Subtitles: DVB, SRT, text MKV. MAG256/MAG257 Set-Top Box, Mini jack cable to RCA (A/V), remote control, 2 AAA batteries, packaging, Power adapter 12 V 1 A, User manual. 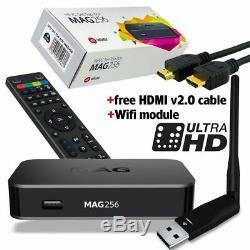 The item "MAG 256 Set-Top-Box BRAND NEW MAG256 with WIFI 150 MBps HDMI cable US Power" is in sale since Monday, January 15, 2018. This item is in the category "Consumer Electronics\TV, Video & Home Audio\Media Streamers". The seller is "user1088818" and is located in Van Nuys, California. This item can be shipped to United States, Canada, United Kingdom, Denmark, Romania, Slovakia, Bulgaria, Czech republic, Finland, Hungary, Latvia, Lithuania, Malta, Estonia, Australia, Greece, Portugal, Cyprus, Slovenia, Japan, China, Sweden, South Korea, Indonesia, Taiwan, South africa, Thailand, Belgium, France, Hong Kong, Ireland, Netherlands, Poland, Spain, Italy, Germany, Austria, Bahamas, Israel, Mexico, New Zealand, Philippines, Singapore, Switzerland, Norway, Croatia, Brazil, Chile, Colombia, Uruguay, Antigua and barbuda, Aruba, Belize, Dominica, Grenada, Saint kitts and nevis, Saint lucia, Montserrat, Turks and caicos islands, Barbados, Bangladesh, Bermuda, Brunei darussalam, Bolivia, Ecuador, Egypt, French guiana, Guernsey, Gibraltar, Guadeloupe, Iceland, Jersey, Jordan, Cambodia, Cayman islands, Liechtenstein, Sri lanka, Luxembourg, Monaco, Macao, Martinique, Maldives, Nicaragua, Oman, Peru, Pakistan, Paraguay, Reunion, Viet nam.